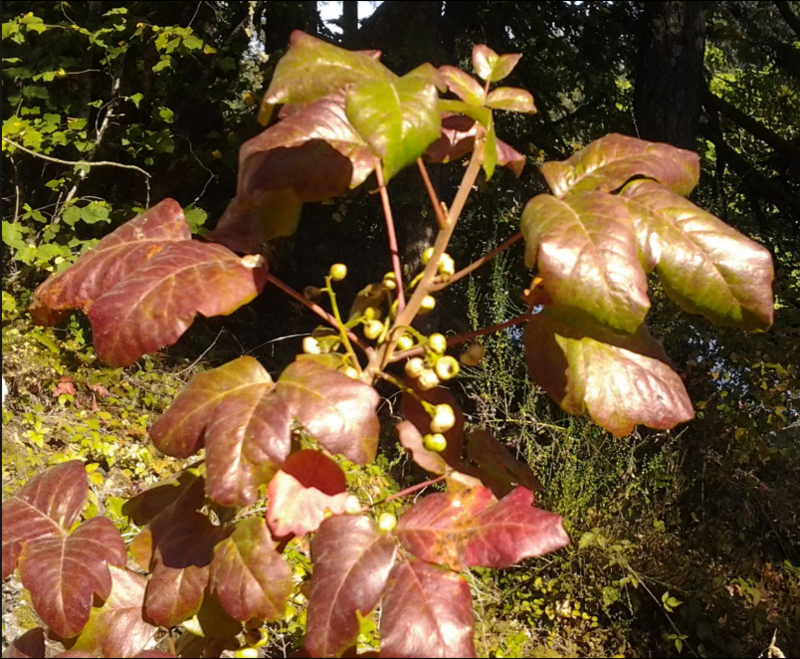 Names: Pacific Poison-Oak belongs to a genus of plants well known to cause severe skin irritation after contact. Toxicodendron means “poison tree.” Diversilobum means “different lobes,” due to its irregularly lobed leaflets that resemble oak leaves. This species may also be called Western or California Poison-Oak or Yeara. Relationships: Members of this genus were formerly included in Rhus (the sumac genus). There are five species native to North America, including Poison-Ivy, T. radicans, of the eastern United States; and at least one species in South America and several more native to Asia. Distribution: It is found from Vancouver Island and nearby islands in British Columbia to Baja California, mostly on the west side of the Cascades in Oregon. In Washington, it is most common on Puget Sound islands and nearby shorelines, and along the Columbia River. It is very common on the west side of the Sierra Nevadas and in the Mojave Desert in California. 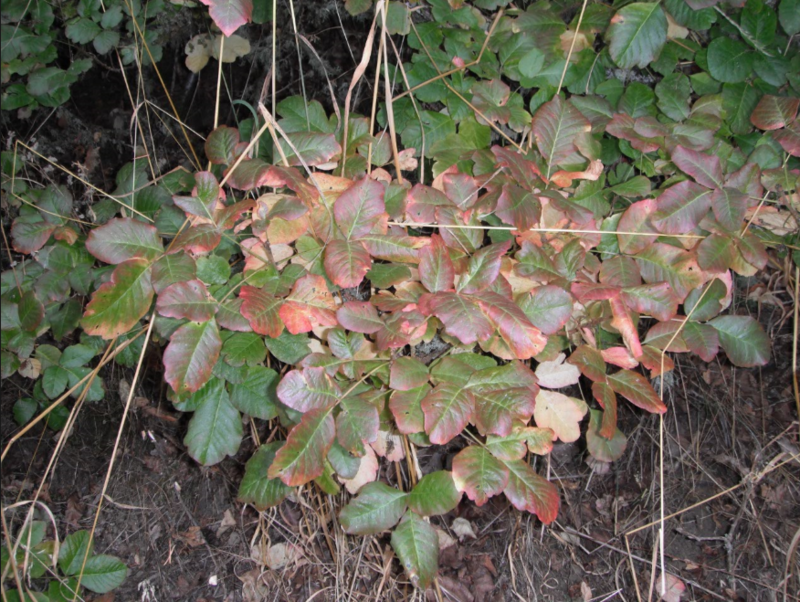 Growth: Pacific Poison-Oak is usually a shrub growing 3-6 feet (1-2m) tall, but sometimes is a vine growing up to 45 feet (15m). 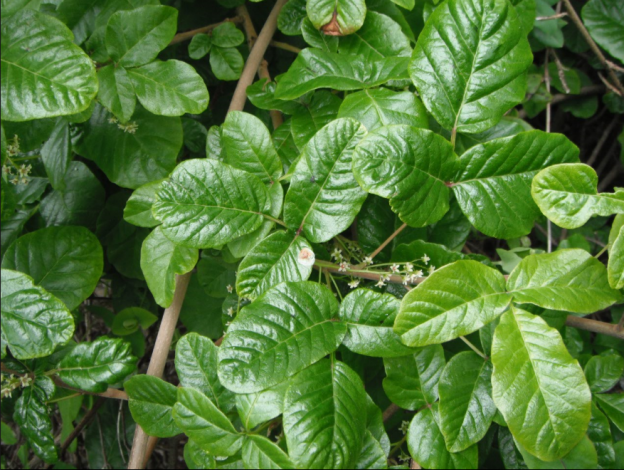 As a vine, a Poison-oak climbs trees or other supports by adventitious roots or by wedging stems within crevices. 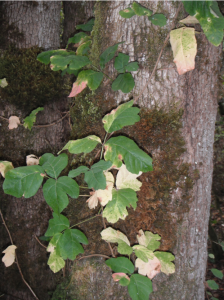 Poison oak is usually a shrub but will sometimes grow as a vine up a tree. Habitat: It grows in acid soils on dry to moist, rocky slopes or riparian zones; most often with a southerly exposure in the Puget Sound Region. Diagnostic Characters: If it has “leaves of 3, let it be!” is a well-known warning referring to Poison-oaks and Poison-ivies. It is a useful identification characteristic, although sometimes there are five leaflets per leaf. Leaflets are irregularly lobed or scalloped, similar to an oak leaf. or sometimes just wavy or nearly entire. Leaves growing in the sun are often thicker and more waxy. Leaves growing in the shade on climbing vines are often thinner and duller. 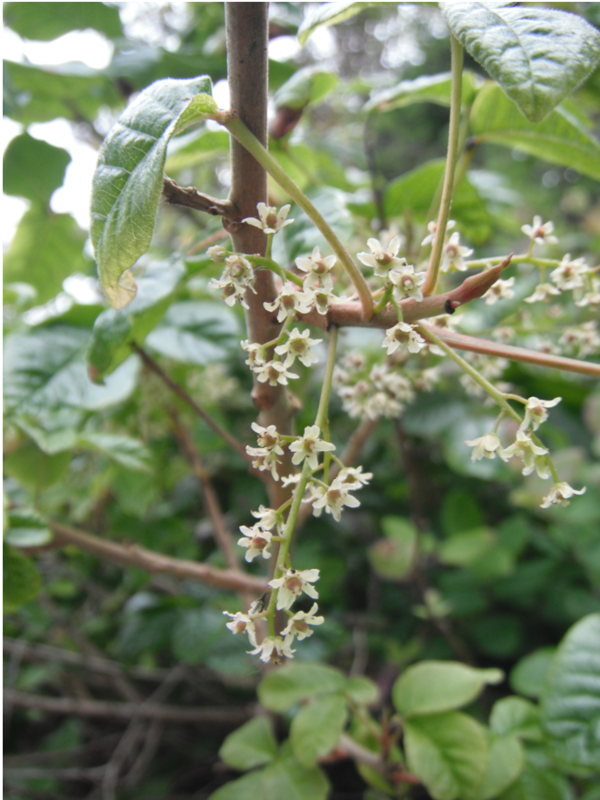 Small greenish-ivory flowers are borne in axillary clusters; with male and female flowers on different plants. Smooth, white fruits are berry-like. Seeds are white or tan and deeply grooved. Stems exude a milky juice when cut. 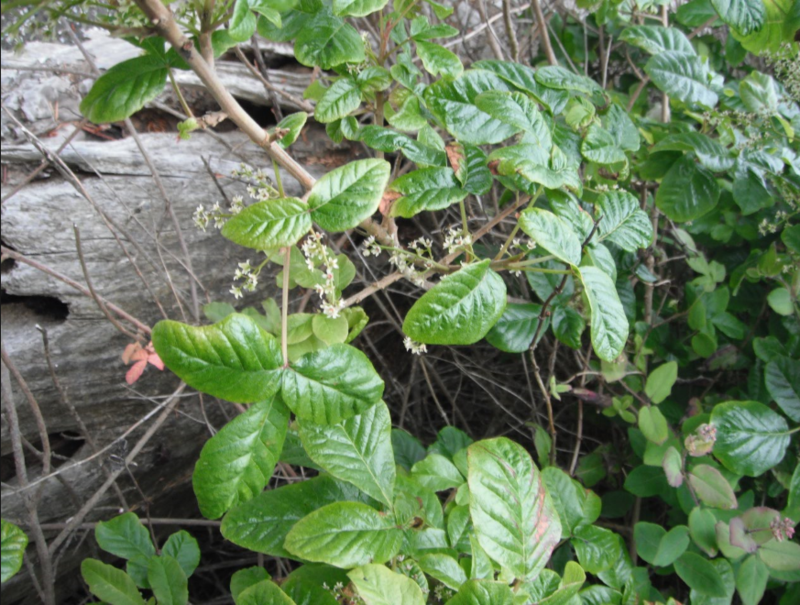 In the Landscape: Poison oak is not usually grown in a garden, unless it is a specialty poison garden. It does however have attractive fall foliage of a pinkish hue. In fact, people will sometimes unknowingly pick up the pink leaves on an autumn hike because they are pretty. 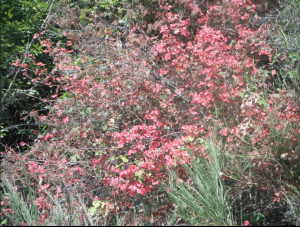 Poison Oak has attractive Pink leaves in Autumn. Propagation: Seed is best sown in a cold frame as soon as it is ripe. Pre-soaking the seed for 24 hours in hot water prior to sowing in order helps to leach out any germination inhibitors. Cuttings of half-ripe wood are best taken in July/August. Use by People: Natives used the stems for basketry. Leaves and roots were used for various medicinal purpose. A black dye was made from the ashes or juice of the plant. The resins of some Asian species are used to make lacquer. Use by Wildlife: The berries have high wildlife value for birds and small mammals, especially Flickers, other woodpeckers and squirrels. Deer will browse the foliage. The shrub is used for nesting and cover by some bird species. This entry was posted in Deciduous Shrubs & Vines on January 2, 2017 by habitatdana.